This sponsored post is produced by Winmo. Spending on marketing technology is expected to hit $32 billion by 2018. Between mergers, acquisitions, and general spending on martech platforms, demand for tech solutions has led to unprecedented YoY growth in this market. According to Walker Sands, there were close to 1,900 martech companies across 43 different product categories at the beginning of 2015. Based on YoY estimates, that means the market nearly doubled from 2014-2015. Interestingly, despite rapid market growth and high demand, 51 percent of marketers don’t think their companies are investing enough in these solutions — an opinion that very well may change soon considering the large investments being made in mobile advertising and marketing technology heading into next year. So, as we move into 2016, what buying trends do tech companies need to know in order to get in front of key decision makers and win more business? According to research from Google, B2B researchers perform an average of 12 searches before engaging with a brand’s website. It’s also worth noting that 71 percent of these researchers start with a generic search query and nearly half are millennials. 91 percent of marketers begin their search for marketing technology solutions using a laptop or desktop computer first. Very few people start the buying journey on mobile devices. Although, as marketers move through the buying journey, the use of mobile devices significantly increases. 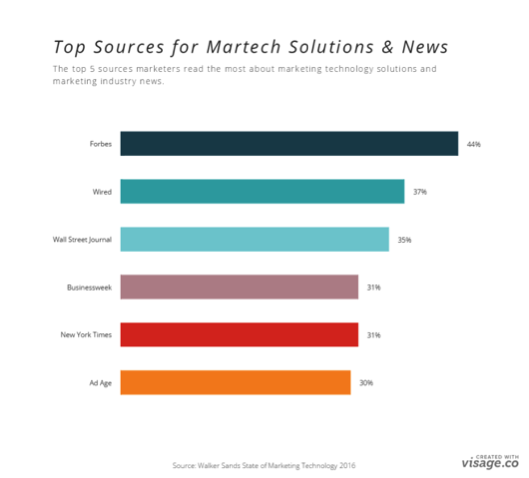 The top three places marketers go to read about marketing news and martech solutions are Forbes, Wired, and the Wall Street Journal. Forbes is the most read publication for marketers at every level, except for CMOs. Although it’s a slim seven percent margin, 60 percent of CMOs prefer to read Wired. When making decisions on tech solutions, marketers are most influenced by peer recommendations, followed by online reviews and analyst reports. Martech prospects engage with 7-15 touch points before converting into qualified leads. Considering that only five percent of marketers report learning about new technology from sales reps, these touch points can serve as vital research tools for target audiences. The types of content that play the largest role in buying decisions are product demos, case studies, testimonials, online reviews, and company websites. When deciding on a martech solution, 73 percent of CMOs consider price a top priority, while 77 percent of VP/Director level decision makers prioritize ease of use over price. What to make of this? Well, for starters, marketers are strangely quirky when it comes to making purchase decisions on marketing technology solutions — although, those were beans spilled a long time ago. Referrals are unbelievable sources for new business. Earned media — especially reviews, testimonials and content syndication — plays a significant role in determining who wins marketers’ business. In an increasingly crowded marketplace, martech companies will have to get creative with marketing and advertising in order to get in front of key decision makers and win more business in 2016. Winmo is the industry’s leading sales intelligence platform, empowering sales professionals who target national advertisers and their agencies to win more business. Keeping your sales pipeline full, Winmo is uniquely designed to progressively map your prospecting patterns over time and serve you with suggested lead suggestions in return. To learn more, visit www.winmo.com.